Hi, all. I hope you are well. For this week, we have an image prompt. As with any images I give you, you can follow suggestions, or ignore them completely and go with whatever idea flashes into your mind. 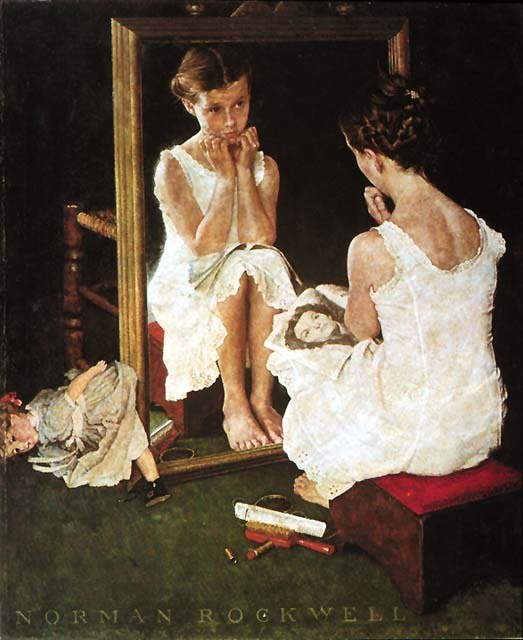 The artist we are looking at for a couple of image weeks is Norman Rockwell, an artist I believe has become… underrated? forgotten? pigeonholed? When I was looking around for the next artist, I came across his work and settled in to have a good look. It had been a while since I had looked at any Rockwells. I tended to think of his art as ‘very good at what he did,’ as magazine cover art, or as caricature. After an hour of looking, I realised I had been underselling his work to myself. 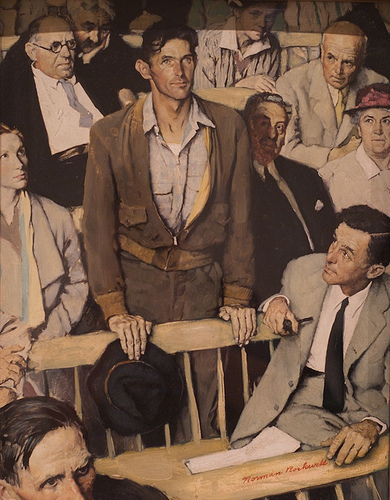 If you study the three works I have chosen, you will see that it is Rockwell’s incredible ability to reproduce what he conceived, as if he had taken a photograph, that puts him in the top tier of artists and, at the same time, often causes his work to be dismissed by modern audiences. Look at the wealth of detail in each painting. Not an impression of background, or a loosely suggested few things, but an exact accounting of every part of the scene. Look at the faces and their expressions. I felt as if I could call out to the characters. 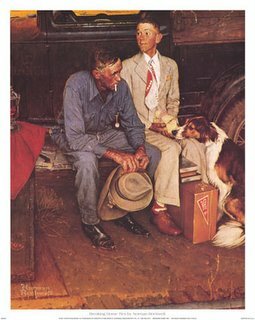 Rockwell’s work was used as magazine cover art, he did paint caricatures, but his work covers far more. Resist looking up the paintings to see their titles. That plants too firm a direction. Unless you have a reason for making it part of the poem, we shouldn’t know a piece of art is involved. In general, I would say, choose the painting that speaks to you and go with your idea for a poem but, should you want suggestions, here are a few. Choose a painting. List everything you observe about the main person. Look for details: physical, clothing, background, other people… Don’t draw conclusions yet. Now, from the list of facts, spend several minutes writing what you think your person is like as a person, their character traits, based on what you observe. What does this person look like s/he might be or do? Pick any painting. Jot down everything you notice. Don’t miss the tiniest detail. Don’t draw conclusions yet. Now jot down the things you associate with some of the things you have noticed. See if anything forms a pattern. From your notes, pick a direction that pleases you and write. You might try a prose piece, a haibun, or a form as tightly structured as a Rockwell. Enjoy your last week of freedom, those of you who are about to embark on Poem-a-day. Me? Do I look nuts? Which is not to say I don’t admire you. I shall see you Thursday for announcements; Friday for the roundup; and next Tuesday for a prompt that should satisfy everyone’s requests… sound ominous? Heh heh. Neat. One of my groups just did a Rockwell painting prompt. We started out looking for cliches to write on/about/against, and decided to use one of his illustrations because his subjects are so (I’m too lazy this morning not to use the word) iconic that they straddle the border. Of course, some of the images are the originals. What’s derived from them is what gives them a bad name. Exactly! I was amazed when I started to really look at his work. I’ve loved Rockwell’s work since as a small child I would crouch under the table while the Grans and Mum and Dad played cards, gloating over a huge pile of Saturday Evening Posts. I’m too tired to start again now, having given my all to Joseph’s ephemeral reverie this morning. Maybe tomorrow. His stuff is stunning, ViV. I have always liked it, but never appreciated it as I should and now do. I would love to see originals. I have my Joseph poems ready to print on postcards, so I can find a place to pin them up. Must go do that. I have written a small French version, which I will put up tomorrow. How lovely, ViV. Don’t forget to take a photograph. I was that age, Hannah, when I first got to know his art. I am glad to be revisiting. Neat coincidence, Margo. I His work is truly amazing, I think! 😀 Yep, I know those morning fingers. Even worse, when you reach my age apparently the fingers move faster than the brain, or the other way around. I now make typos with everything I type. Never used to. That’s okay, Margo pretty soon we’ll be able to wire-lessly “hook-up,” to our computers and the words we think will just magically appear!! I don’t know that for sure but it seems like the next most logical step. :)! Oh, I like that, Hannah. You are quite right. Bring it on. <— ok…yes…looking a little nuts. I'll be back with my poem. Yay! It’s morning and I shall start my day with you, Paula. Yep. Big grin. I mean aren’t you? That’s not to say that it isn’t a wonderful thing from which many people will have many poem drafts. Laughing at your not so subliminal message, Mark. I shall visit shortly, when my brain forms intelligent thoughts. eh, why not another? Just a quickie. Here’s mine. It’s a bit longer than I’d want, so might chop at it a bit during the week. Can’t today. I’m off to London, and running for the train. Margo, thanks. Great fun this was. Here’s a link to my poem, The Judge. http://vivinfrance.wordpress.com/2012/03/29/young-girl-dreaming/ Sorry I’m late: I’ve been busy poetry bombing. Thanks again for the Rockwells. Sure, Barb. Keep telling yourself that. Like I said: Nuts. Although, I am trying to tell myself that I don’t have to write every day [which thought sends me into a large dark cave] only the prompts that spark. I ‘ll see if that works. I would like to be a small part of the madness. Don’t know what it is about Rockwell, but his pictures almost always make me feel myself looking at the subject, if that makes any sense. This is the link to the piece I did for my group the other day. I went with another Rockwell painting, if that’s ok.
Oh, Irene, I am so tempted to say ‘No, it’s not okay’. Of course, it’s okay, but thanks for the warning!. I’ll be over to read in a minute. I chose the girl at the mirror. I wanted to paste the photo in with my text, but can’t seem to figure out how to do it. Sarah, I right-click on an image and copy paste. Macs should have the same function. Thanks, Margo. I will try it. I do agree with you that Rockwell’s work comes across too clean, but I think he felt that’s what was needed at that time. For every good he holds up, there is the strong reminder that it’s being held up because the other side of the coin exists. Does that make sense? I think he would have lived in our century with no problem, just different coins. I am working on a stage play “Rockwell” based on vignettes of Rockwell’s paintings. But this prompt added one to the Santa Claus file, always good for a smile. Walt, that sounds really neat. It’s a play I would buy tickets for. Great premise.